Metro has cre­at­ed a Home­less Task Force, com­pris­ing of var­i­ous inter­nal and exter­nal part­ners focused on address­ing home­less across Metro’s Tran­sit sys­tem. Com­mu­ni­ties in Motion is work­ing with Metro (the Los Ange­les Met­ro­pol­i­tan Author­i­ty) to devel­op a strate­gic plan to address home­less­ness in and around its tran­sit sys­tem. 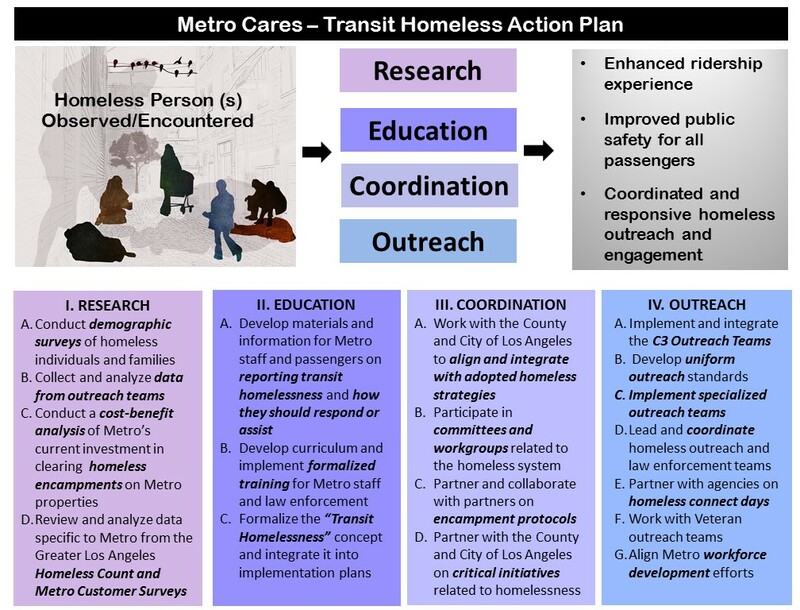 On March 1, 2017, after a series of com­mu­ni­ty and stake­hold­er engage­ment, Metro released their Tran­sit Home­less Action Plan, involv­ing strate­gies that reflect a tar­get­ed, col­lab­o­ra­tive and response approach to home­less­ness in its tran­sit sys­tem. This plan focus­es on research, edu­ca­tion, coor­di­na­tion and out­reach with an imple­men­ta­tion begin­ning March 1, 2017. Back­ground: The increase of home­less­ness in Metro’s tran­sit sys­tem is impact­ing rid­er­ship and its pub­lic safe­ty envi­ron­ment. Fur­ther­more, home­less indi­vid­u­als and fam­i­lies seek­ing shel­ter in Metro’s sys­tem are in need of ser­vices and access to hous­ing resources. With the adop­tion of Coun­ty and City of Los Ange­les strate­gies to address home­less­ness in Feb­ru­ary 2016, Metro rec­og­nizes the need to address home­less­ness in and around the tran­sit sys­tem that will align with Coun­ty and City of Los Ange­les pri­or­i­ties. Metro cre­at­ed a tran­sit home­less action plan that pro­motes a safe and clean envi­ron­ment for patrons while con­nect­ing home­less per­sons in the tran­sit sys­tem to need­ed ser­vices and resources. This plan focus­es on inter­nal and exter­nal strate­gies clus­tered around research, edu­ca­tion, coor­di­na­tion and out­reach. To devel­op this plan, Com­mu­ni­ties in Motion led a com­pre­hen­sive com­mu­ni­ty and stake­hold­er engage­ment process to bet­ter under­stand the scale and scope of tran­sit home­less­ness, while also solic­it­ing ideas and feed­back on solu­tions. Imple­men­ta­tion of this plan has begun March 1, 2017.